Oh hey, Santa Fe. Your flavors are rich and inviting. On a recent trip to Santa Fe I got to eat my way through the town. I was given specific orders to eat something with green chile and to get my hands on some sopapillas. Done and done. My first food experience was fancy catered wedding food. Every bite was bold. We started with a baby spinach salad wrapped in cucumber, topped with crispy bacon, and drizzled with a goat cheese dressing. Not pictured: mini scallion cheddar cornbread. Then, the main course: a surf and turf dish – chicken with romesco and fish with chimichurri – served with grilled mixed vegetables and basmati rice. The food did not end there — there was a dessert table all night, and as the evening progressed, burritos and waffles. We were stuffed to the brim. And then the altitude kicked in and started to affect me. 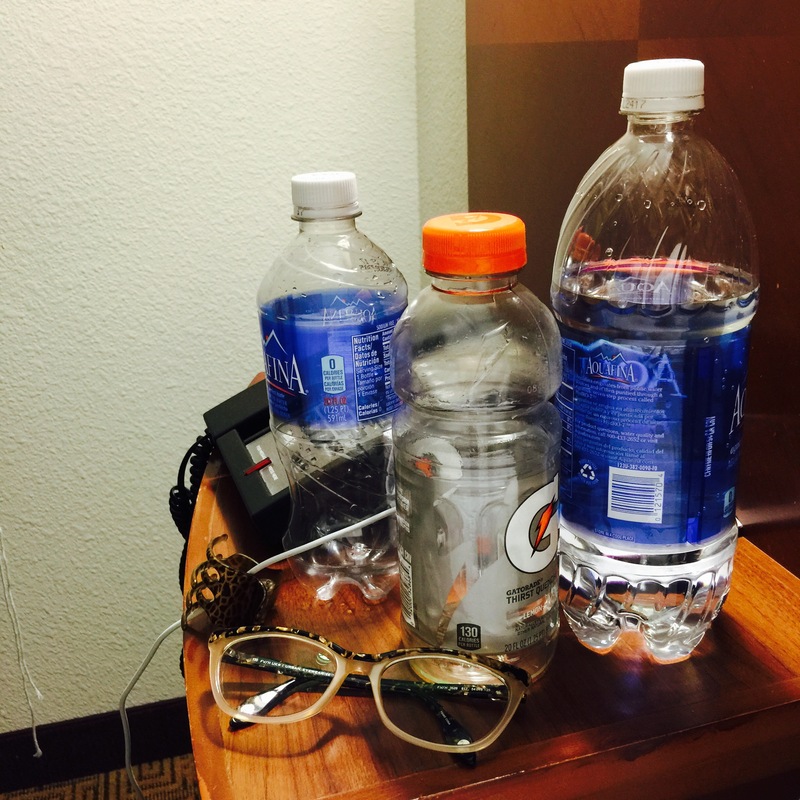 My nightstand made it look like I was sick all weekend, but I didn’t let it stop me from seeking and eating more delicious food. The next morning I headed to Chocolate Maven for brunch. It’s located in an almost secluded area and you wouldn’t think to look there for a restaurant, but oh – the people knew to look there for a restaurant. I tried their green chile sausage. The picture doesn’t do it justice; it just looks like brown blobs, but OMG. This was some gooooood sausage. It was salty and spicy, and oh so satisfying. Their potatoes were quite delightful as well, and their eggs perfectly soft poached. Aside from the savory, they had pastries as big as your face and an assortment of cookies and other baked treats. I tried a bite of a poppy seed chocolate chip cookie. What a weird combination, but it totally worked! That evening I went sopapilla hunting. I visited Maria’s and couldn’t decide on just one item so I got a combination plate. I had one of each: taco, tamal, enchilada, and chile relleno. Ha! This lasted me through to the next morning for breakfast. I also tried sopapillas for the first time. I suppose I should have researched a little bit more on my own. I thought it was going to be savory, stuffed with meats, or something like that; it turned out to be a type of fry bread. You can eat it sweet or savory; I found out I like it best with honey. On day three, I was still feeling nauseated and all I wanted was to eat some fresh vegetables. Raw vegetables are hard to come by on vacation sometimes. Teahouse to the rescue! I found myself a sweet spot under a tree and enjoyed an iced soy chai, kale Ceasar salad, and an artichoke, goat cheese and reduced balsamic panini. Fresh, crisp, bold, refreshing…just what I needed. 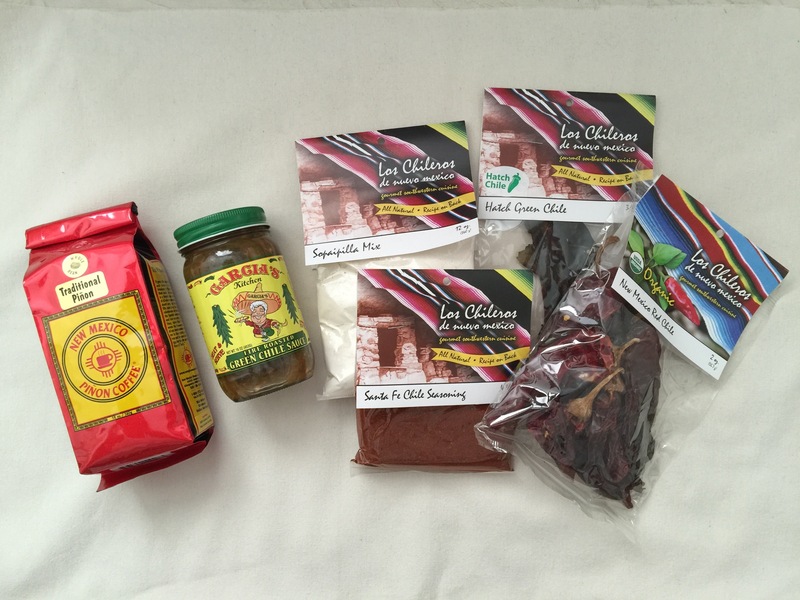 And lastly, I had to make my way to a local market to bring home the best in New Mexican flavors and Santa Fe favorites. Here’s what I gathered: piñon coffee, Garcia’s green chile sauce, sopapilla mix, Santa Fe chile seasoning, dried hatch green chile and New Mexico red chile. Have you been to Santa Fe? What were some of your favorite eats? Share below! Previous Postembroidery with zelma rose.